Timber Block is getting ready for the year's largest light construction show of the year - The 2019 NAHB International Builders Show (IBS), happening February 19-21 at the Las Vegas Convention Center. 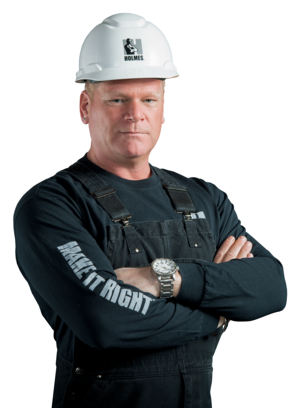 This year, we're excited to announce TV Show Host, Influencer, General Contractor and Timber Block Partner Mike Holmes will spend time in our Booth C2049 Tuesday, February 19 from 1:40 - 2:10 pm. This is an opportunity for visitors of our booth to come and meet Mike, as well as many other Timber Block experts. IBS is a showcase of the latest and greatest products in the construction industry, and will see close to 80,000 visitors throughout the 3-day show. The partnership was created in late 2017, marking yet another advancement in the home building industry. The partnership was a natural one, as Mike Holmes, along with the Holmes Group share the same dedication to building the highest quality of homes. "For my Holmes Approved Homes program, we set out to find the best builders...the guys who care about what they do. That's why we searched Timber Block out - they care about HOW a home is put together, not just how it looks. It's not about the icing on the cake, it's about how the cake was made. Timber Block has perfected not only what you see, but also what you don't see. Timber Block knows how to do it right, and that's why they're now a part of the Holmes Approved Homes program. Now homeowners get to benefit from this project," says Holmes. The partnership was celebrated a special event at Timber Block Ontario's Innisfil location....watch below! The Timber Block and Mike Holmes Partnership reached another level with the Integration of the Mike Holmes Inspection Program. This was a game changer for the home building industry, allowing homeowners to feel comfortable knowing they are building the highest quality of home. This announcement was also welcomed by builders and general contractors: not only are they ensuring they are constructing a high quality, highly energy efficient and sustainable product, but they're doing so in a much faster timeframe. * See below for details. What is the Mike Holmes Inspection Program? There are several points that need to met in order to pass inspection according to this program. These are very carefully studied, and will only pass once the highest grades are achieved. This is an important step in the inspection process, as the homeowner is guaranteed all facets of the factory related process has been approved to the highest standards of the Mike Holmes Inspection Program. An approved Mike Holmes Inspector will confirm the structural framing and all Timber Block products are in order, including the building envelope, all exterior trims, all structural elements and all weather proofing is complete. An approved Mike Holmes Inspector will validate the level of energy efficiency in the home. This will be a close look at the insulation and vapor barrier, the sealing of the building envelope, the installation of the window and will complete a blower door test. Once the inspections are completed, a report will be given to both the Timber Block Project Manager and homeowner, with the Project Manager reviewing the findings with the client and the Builder or General Contractor. The end result means our homeowners are more than confident in the choice they've made knowing they have built their dream home to last. Get your free download of the Mike Holmes Inspection Program! Click below. *Timber Block Homes Assemble in Hours. Timber Block's advanced building system allows the walls of the home to be assembled in a controlled environment. The walls are then flat stacked and easily shipped anywhere in the world. The result is a much faster build, saving time and money. Plus, the homeowner gets to move in quicker - in fact, weeks, if not faster than a traditional or stick-built home. Learn more about Timber Block's technology. Visit www.timberblock.com. To speak with a Home Consultant, click below.